A very rare Leyland, for these shores at any rate, was the Royal Tiger Cub. Designed as an export chassis it sold in respectable numbers from Finland to New Zealand, even (when supplied as a kit of running gear) incorporated in DAB (Danish Automobile Building) integrals. The only chassis sold on the home market were for Doncaster Corporation who took twenty 33ft Roe bodied examples in two batches of ten in 1965 (type RTC1/1) and 1968 (type RTC1/2). Although all were 33ft two door examples the body style differed between the two batches, the Roe bodywork on the second batch were similar to that supplied to Leeds and Huddersfield on their AEC Swifts. The photo shows preserved number 55 which is an RTC1/2 of the second batch. The Royal Tiger Cub was very much an anomaly. 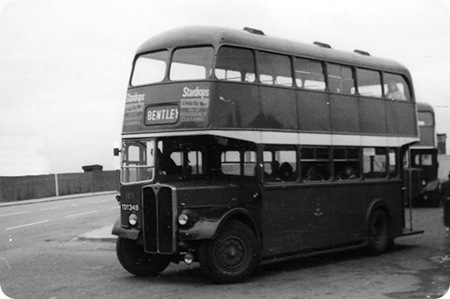 The Leopard – which became a classic – first arrived as a special for Sheffield (Corporation) Transport Department. Bodied as Weymann Fanfare coaches in summer 1959, the first six predated the Scottish Show model by several months and were recorded in Leyland books as PSUC1 (Tiger Cub) specials. By the time of the official launch in Glasgow later in the year, the Leopard L2/Plaxton of Milburn Motors introduced a new name and series. The Leopard was, therefore, a Tiger Cub but with 0.600 engine and Titan gearbox. The only noticeable difference between the Royal Tiger Cub and Leopard was the 33′ length. Another case of micro managing slight differences in specification. The first Doncaster RTC1 had "Real" Roe bodies – as seen just behind No 55 in the above shot. 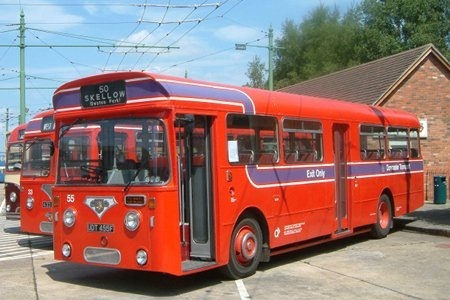 As stated, 55 had Roe bodywork similar to Leeds, Huddersfield (and Sheffield) Swifts – on Park Royal frames. Just to offer photographic assistance to the comment made by one of your contributors about the body style of the first batch of Royal Tiger Cubs bought by DCT. See below for a better shot of the vehicle he refers to (which was partially hidden behind the subject of the original photo). In fact the first batch of RTC were not of this style Roe body but more like the batch prior to this which were on AEC Reliance chassis. I don’t know whether those bodies had any Park Royal input but there were similarities in design features with Yorkshire Traction’s Park Royal Tiger Cubs, trim etc was different but there were similarities in appearance. A significant difference was the absence of the traditional Roe ‘Trade rail’ below the windows although comparison with the Roe bodied ex Felix Reliance parked next to 33 shows that the trade rail was by no means a standard feature. If you visit this site on a regular basis the last bus that was on stand was a Sheffield Corporation AEC Regent III that looked like a Regent V here we have a Doncaster Corporation Regent V that looks like a Regent III. It was possible to order the Regent V with an exposed radiator until 1960 which was six years into production before the wide bonnet look took over completely. In 1956 the Bentley trolleybus service in Doncaster was converted to motorbus operation and I think these Regent V buses were acquired to fulfil the part. The AEC code for this bus was MD3RV which meant this bus had the smaller six cylinder 7.68 litre engine with a four speed synchromesh gearbox and triple servo vacuum brakes. Doncaster was, of course, famous for transferring some of its trolleybus bodies onto PD2 and CVG6 chassis when the trolleys were scrapped. The trolleys had been rebodied fairly recently so the bodies still had lots of life in them, and at least one of the PD2s still survives. They were unmistakable as they retained the thick second body pillar upstairs where the power cables were trunked up to the roof, and on the PDs the body never quite sat right over the windscreen, having a slight overhang. There are actually two survivors of this exercise. All the Daimlers that received the ex trolley bodies were new chassis as were two of the PD2’s however four of the PD2’s were some 16 years old already when their original bodies were scrapped and replaced by an ex trolley body. 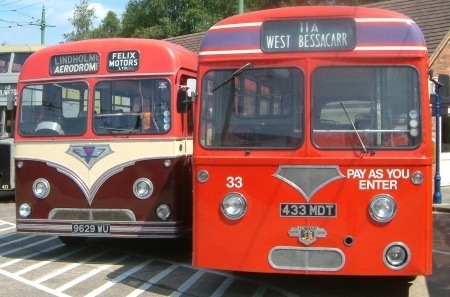 Both survivors are Leylands and represent 1 each of the ‘old’ and ‘ new’ chassis. When you realise that a lot of the bodies had themselves originally been built on second hand chassis as Doncaster took advantage of good second hand purchases thrown out as other operators closed down their trolleybus systems you’ll realise what a complicated story this was. 94, the oldest survivor actually received the body off EWT 478 that had originally been new to the nearby Mexborough and Swinton fleet in 1943 with a utility single deck body. The six vehicles of this type operated by M&S were bought by Doncaster in late 1954, the original bodies removed and scrapped and the chassis sent to Roe to be fitted with the new double deck bodies that would eventually find their way onto diesel chassis.The ‘new’ trolleybuses entered service in 1955 but would only have eight years use before the Doncaster trolleybus system closed in 1963. Trolleybus 375 and 94 live at Sandtoft Transport Centre. How refreshing Chris to hear favourable comment about Leeds 910 – 924. I too admired them greatly and have spent many hours in total trying to get the detractors to tone down their often wildly exaggerated abuse of these handsome buses. My only criticism of them was, from a driver’s point of view, that tall people like me had great difficulty in seeing in the nearside mirror due to the position of the canopy – I notice that on preserved 916 a mirror with a longer arm which will no doubt of cured that little blip – possibly the others were similarly treated while in service ?? Chris, my native Nottingham also bought 65 exposed radiator Regent Vs in 1955/56. They came in two almost identical batches with Park Royal bodies. The first 30 (UTV209-238) seated 61. The remaining 35 (XTO239-273) seated 62. They were the last of a long line of Regents that started in 1929 and over the years totalled 478. 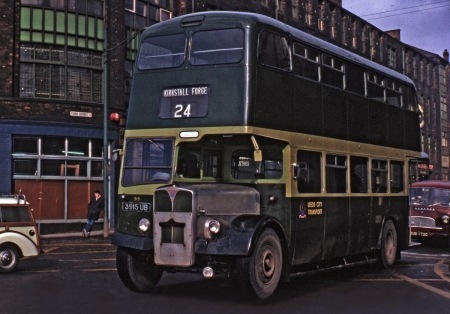 Subsequently NCT took 44 Leyland PD2/40s in 1958/9 (the first Leylands in the fleet), but reverted to AEC in 1965 for 42 Renowns which were Nottingham’s last half-cabs. Chris Hough mentions the exposed radiator Regent Vs of Leeds City Transport with MCW bodywork, that dated from 1960 until withdrawal in 1975. Here is No. 915, 3915 UB on a rather dismal day in Leeds in April 1970. Rhondda Regent Vs 400-424 all had exposed Radiators and Weymann Orion bodies and I’m sure there were other examples. Roger’s picture clearly shows the extended mirror arm which I mentioned – so presumably they were all similarly treated. The MCW body sat comfortably and tidily on the exposed radiator chassis. Also of interest in this picture is the destination "Kirkstall Forge" – a fairly unusual short working of services 24/5/6/7 from Swarcliffe to Horsforth. Did anybody besides Sheffield have Regent III’s with Regent V grilles? 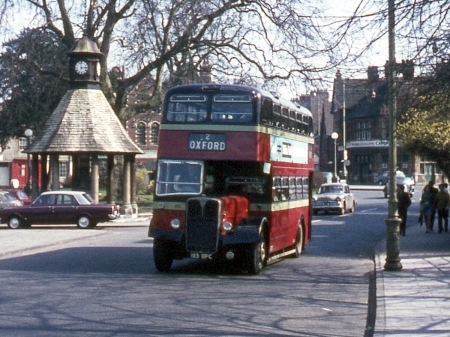 Another exposed radiator Regent V with the Orion body is seen here in Oxford, wearing the resplendent livery of City of Oxford Motor Services. The lowbridge version of the Orion, as worn by MD3RV304, COMS No.193, 193 BFC, always looked less gawky to my eye than the highbridge variant. The best looking Orion bodies ever built were surely those supplied to Aldershot and District in 1964/65 on Dennis Loline III chassis, where the visual balance was greatly improved by the low level of the lower saloon window line, and then enhanced further by the excellent A&D livery. It’s the first time I have been on your site and it has brough back some terrific memories. In the 60s and 70s I worked for Doncaster corporation transport department as a conductor and later a driver.The A.E.C. in your picture is coming of the bus stand on the North Bridge on its way to Bentley, in 1968 I was conductor on one of the Bentley service buses, it was in the summer, a very hot day and we were stood in traffic waiting to get on to the stand, along side us was a cattle truck, my driver was sat with the door slid wide open, a cow on the truck took short and peed on my mate, the door was jammed open, and poor old Jock couldn’t shut it. He was drownded in cow pee, the passengers on the bus burst out laughing and the bus shook from side to side. when we got onto the stand the cab floor had about 6 inches of cow pee in it, poor Jock was soaked to the skin. This is a true story the picture of the AEC brought it flooding back! the driver should be in the Guiness Book Of Records – the only man to be peed on by a cow while driving a bus! thanks for the memories. Chris H, after death and taxes the next thing you can be sure of in this life is of being immediately proved wrong if you post on this forum! Mention has already been made of exposed-radiator Regent Vs with Nottingham and Rhondda – there were actually 27 Rhondda examples, 298/9, 400-24. In response to Eric B’s question re Regent IIIs with Regent V-style grilles, here’s one with a Regent V-style grille, but obviously not a Regent V-style bonnet. The chassis, a Regent III prototype, remained with AEC as a test chassis for several years, before being sold to Liss & District who had it bodied by Roe as seen here. Later recorded with Creamline of Bordon (an associated concern), and later still with Super of Upminster, it is thought to be depicted here with Creamline. Yes, but don’t forget the (roughly) 80 Regent IIIs delivered to Sheffield in 1955/56 with Roe and Weymann bodies. They all had Regent V fronts. Sheffield wanted heavyweights and only the lightweight Regent V was available initially. They therefore took delivery of 9613S chassis with Regent V fronts.